Considering you are starting with your prep from 5th July, you have 150 days before CAT, expecting CAT to be in last week of November as last year. If you are a serious CAT aspirant , it’s still possible to bell the CAT with high percentile in 5 months ( approx) prep. 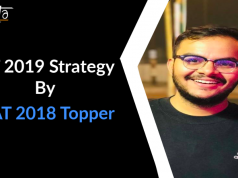 I will help in designing the outline for your plan with the help of the Facebook Cat Preparation – iQuanta group and iQuanta such that you will be able to build your own strategies. With 97%le each in all the three sections will land you close to 99%le overall. And 99 in all three sections will land you more than 99.7+ overall. Note: The plan is strictly for serious aspirants aiming 99 + in CAT. You need to put at least 3 hours/Day in weekday and 10-12 hours/day on weekend. (Please change according to your requirement if you feel exhausted). First, I would recommend you to take at least 1 mock (say today) and do the thorough analysis. Pen down all your strengths and weakness and create your own Plan. Keep practicing in CAT Preparation-iQuanta from Day 1 (today) till 20th November randomly, as practicing randomly helps you to be prepared for Actual CAT more than a chapter wise practice does. Follow iQuanta articles ( Concepts) for add-on help (www.iquanta.in). 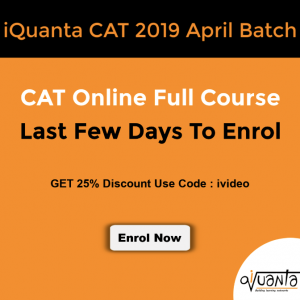 You may join iQuanta Quant Course which is of immense help to develop concept and methodology to tackle CAT questions. 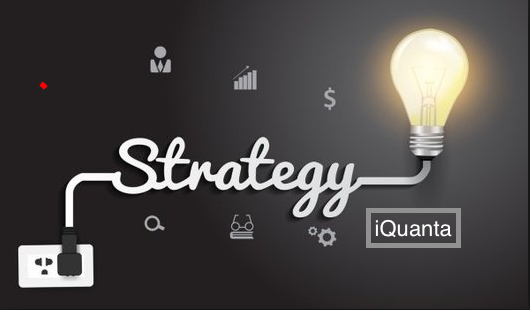 Regular sessions by iQuanta till CAT will help you be sticked to your plan and be regular which is the most important part of CAT Preparation : Regularity. Para Jumbles and Para Completions. Reading comprehension (1 hour/Day on weekdays and 2.5 hours/Day on weekends or holidays) till November 30. Start with at least 3 passages per day then increase to 4-5 passages once you gain Accuracy. Here quantity is not important, quality is, focusing that you gain at least 90% Accuracy. Focus more on overall comprehension rather than Word to word meaning at this point in time. 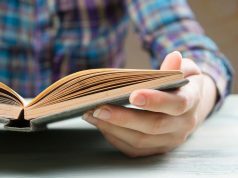 Click here for Books and Tips or follow GMAT Books. FB CAT Prep Group/iQuanta Events. – This area generally needs lots of practice to get hands onto a variety of sums. Papers from the institute or mock papers from other coaching class or practice test available for free on net/group. For video classes on LRDI, you may join iQuanta LRDI classes till CAT. There is coaching institute which provides sectional test/ mocks; also there are some sectional mocks which are readily available on the net as well. Get hold of that for sure. Why? 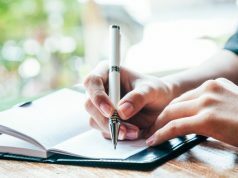 because you need to test yourself on topic wise as well once you are done with your study to get little confident and to ensure you have covered all the areas. Give 2-3 sectional tests on weekends after you complete your topics. Take at least 1 mock per week until 20th November. Once you are done with syllabus; start giving 1 mock/3Days till CAT. Take as many mocks you can. Followed by Mock, analyse the paper, with your weak areas and then focus on your weak areas accordingly. iQuanta will soon update the best way to analyse your mocks this month. Stay tuned. 1) Try to solve questions in CAT Preparation-iQuanta, whenever you see a question, that too fast, if possible try to be the first one to solve. Make it a competitive environment. This has helped one get the speed and all my friends/ students who got phenomenal percentiles this year. 2) Keep solving Questions from your materials and in case you get doubt, post in CAT Preparation group. Somebody will help, if no one helps then tag me I’ll try to clear it. Study Time : 8 PM – 1 AM, It may include all study related activities whether sessions or solving in the group or solving your own materials. 8.00-9.00 AM—Read editorials or newspaper and do Vocab as well. This is the rough plan; one can definitely change or shift timings according to one’s weakness and strengths. I would like to say that do not consider it as full proof, it only helps you to drive your plan. The aim here is not to complete the portion but to have thorough conceptual knowledge. Considering the number of hours I mentioned can definitely change as per your wish but ensure that you cover the syllabus in defined period only. Please compete with yourself and not with others. Every time you take mock ensure you improve and do not take mocks unless thorough analysis of the previous mock is complete. Give time and definitely, you will see some progress. Keep developing shortcuts which can help you in the exam to save time. Join iQuanta Courses for tricks/ shortcuts and Conceptual understanding. It starts from basics and reaches to a bit above CAT level . Enrolments are going on for the same. Try experimenting with your mock paper say for ex. Try using elimination method while answering or using shortcuts to see how much time is saved. Work hard as much as you can. Work Hard Now to Enjoy Later !! Enrolment for third and last batch of iQuanta for CAT18 is going on, you can enrol today, classes will start in 15-18 days and syllabus will be finished in 4 months. Limited Seats. Click here to join iQuanta Courses for CAT 18 and be ahead of others. Previous articleSuccess Story of RAJAN BURMAN, an IIM Lucknow convert! !